The beginning of 2019 indicates a “continued swell of employment opportunities" as job openings exceed the number of available workers. This strong job market suggests that candidates may be considering multiple employment offers. Businesses need to offer competitive compensation packages to stand out, and benefits are a critical element. Benefits typically include employer-sponsored health insurance, dental insurance, retirement savings plans, and other forms of non-salary compensation. According to a recent Clutch survey, approximately one-third of job seekers (32%) begin a job search to find better pay and benefits, indicating the importance of fair and well-structured compensation and perks. Small business app developers continue to make more complex apps with added features. The more people rely on these apps, small businesses are focusing on new ways to secure their customers' data. We surveyed 529 small businesses across the U.S. about the mobile app features and security measures they will prioritize in 2019. We define small businesses as having limited revenue and between 1 and 500 employees, which aligns with the Small Business Administration’s definition of small business. We discovered that small businesses focus on providing personal experiences for their app users, but don’t have sufficient resources to protect their app users' data. In 2018, more small businesses understand the value of a well-targeted mobile app. Mobile apps can boost customer loyalty, brand image, and employee efficiency. However, for a mobile app to succeed, a small business must truly understand the app’s goals, its target audience, and the resources needed to build and maintain the app. We surveyed 351 small business owners and managers to discover the state of small business apps, including why small businesses are building apps and which mobile features are most valuable to small businesses. Read our analysis to learn if a mobile app is a valuable marketing opportunity for your small business. GoDaddy is far more well known among the general population than other domain registration and web hosting companies, and many may say it’s simply due to their controversial advertising campaigns. The company prominently built up its name with NASCAR partnerships and widely-seen Super Bowl commercials. Data backs up GoDaddy’s supremacy. 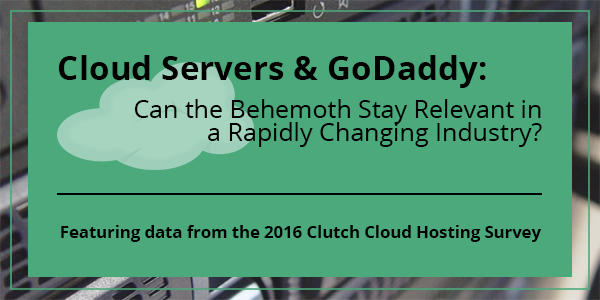 A recent survey by IT ratings and reviews site Clutch shows that GoDaddy overwhelmingly is the most popular option for web hosting among small- to medium-sized businesses (SMBs). 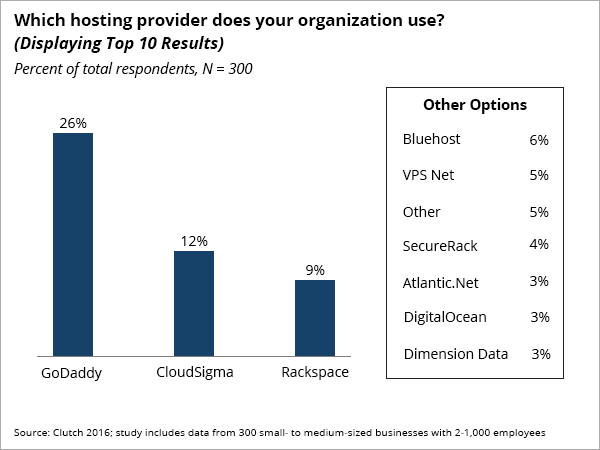 26 percent of SMBs use GoDaddy, which is a full 14 percentage points higher than the second most used provider, CloudSigma. Today, 71% of people think it’s important for businesses to support social movements and expect businesses to lean into controversy and take unwavering stances on issues related to the environment, human rights, gender, and politics. This leaves businesses wondering if they should speak up or stay silent on social issues and how their choices will impact their public relations strategy in the long-run. What people say about a business online has long-term implications for a brand and can determine whether it attracts and retains customers and remains visible online. As a result, more small businesses are dedicating time and resources to monitoring their online reputation as they opt for more proactive strategies. Clutch surveyed 529 small businesses from across the U.S. to gauge how they monitor and manage their online reputation. We use the Small Business Administration’s definition of small businesses as those that have limited revenue and between 1 and 500 employees. The end of 2018 saw a 3.9% unemployment rate in the U.S. The last time the unemployment rate sat below 4% was 2000. Small businesses are benefiting from a strong economy and are boosting their employee rosters accordingly. More than half plan to add employees in 2019, and 57% say it’s unlikely they’ll fire or lay off employees this year. Clutch surveyed 529 small business owners and managers in the U.S. to understand their recruitment plans for 2019. We analyze how many employees small businesses are planning to hire or fire and what types of roles they’re looking to fill. “Me,” Alexa likely would answer, according to our survey findings on consumer use of artificial intelligence (AI). Clutch surveyed 503 people about the connected devices they own and use. We found that approximately one-fourth of people who own a connected device own a standalone, automated virtual assistant such as an Amazon Echo or Google Home (27%). Virtual assistants are powered by AI technology and respond to user requests and voice commands on devices such as smart speakers. We found that people mostly use their virtual assistant to access information and issue simple commands such as setting alarms and checking the weather. Businesses can use this data to understand how people currently use virtual assistants and adjust their search marketing to adapt to voice search commands. Businesses must consider their customers’ values, their brand's unique purpose, and where they can make the most impact when implementing a corporate social responsibility effort. Clutch surveyed 420 consumers from across the U.S. who have made a purchase within the last six months to learn how they want businesses from different industries to show their commitment to social responsibility.